Americans don't know much about electric bicycles. At least not yet. But pedal-assist two-wheelers are huge in Europe and the rest of the world. In some markets, like the Netherlands, they constitute a quarter of bicycles moving out of stores. But here? Especially in big cities, we lump electric pedal-assist with electric scooters and guys delivering lunch. But global e-bike sales were around 32 million last year, per Navigant Research, which says the market will reach 40 million bikes in 2023. Bosch, the category leader in Europe, wants to pedal-assist some of that growth here in the U.S. 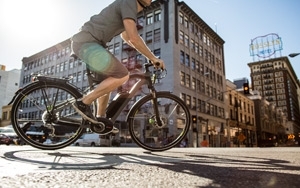 The company, known in North America as an automotive parts supplier, and maker of tools and major appliances, has been selling its pedal-assist Bosch eBike Systems in Europe since 2011. It started selling in North America last year, where it is committing money and resources to raise consideration. In addition to marketing and press relations initiatives, and expanding the dealer network, the division has a new base of operations for the division in Irvine, Calif. But Bosch is calling 2015 “The Year of the eBike.” To be clear, Bosch does not make bicycles. The company makes the battery, drive, sensor, and interface systems, and is partnering with companies like Cannondale, KTM, Trek and Emotion for the physical bike. In Europe, Bosch has around 50 bicycle suppliers; in the U.S., as of model year 2016, there are for the eBike. The system, comprising a PowerPack and Drive Unit, lets the cyclist choose between four levels of assist, from eco to sport, with the battery assist adding thrust until you hit 20 mph. Claudia Wasko, regional business leader, North America, for Bosch eBike Systems, says Bosch started with three bicycle manufacturers as supplier partners stateside. The U.S. market, she says, while not as mature as Europe, is growing. “The eBike will invigorate the entire market,” she says. One potential challenge is bike sellers themselves, especially the high-end racing-bike retailers who have a somewhat supercilious view of pedal-assist. “But when you talk to dealers, they say that today they focus on the male between 20 and 40 years of age. With this device, you enlarge the target; those who didn’t ride before now can. So we are convinced we can dramatically enlarge the market, which has been very stagnant.” She says there are about 160 retailers selling the eBikes now. The eBike isn't cheap, averaging around $4,000, but Wasko points out that the competitive set are not really bicycles, but scooters. The Bosch eBike on “tour” mode goes 40 miles before needing a charge, which takes about two hours for a full recharge, she says. She points out that use of e-bikes is definitely going to be higher in big cities like San Francisco, partly because it flattens the hills. In terms of getting the word out, the company is doing grassroots efforts at bicycle events. Wasko says that at its Bosch Experience events in Seattle and Monterrey, and at major bike shows like InterBike, the company is fielding fleets of the bikes for consumer rides, where, per Wasko, the bikes are pretty much completely booked. Marketing, with the tag, “Life is Better on a Bike,” has been a digital-centric affair focused on lifestyle, and how diverse people are using the Bosch eBike System.